Description: NO MAGAZINE SALES into NEW YORK CITY. CONNECTICUT residents must furnish us a copy of your CT Eligibility Permit or ammunition certificate. This listing is for ONE magazine. From brief light duty with a private security company Here are representatives of the factory Beretta 10 round magazines for the venerable Beretta 92 pistol. Manufacturer is Beretta of Gardone Italy. Construction is certified carbon steel with a heat treated housing and a hi-impact polymer cartridge and floorplate. Each magazine holds 10 rounds of 9mm caliber ammunition. That is five fewer rounds than the standard issue 92 series pistols and their magazines. The 10 rounder’s factory number is JM92F; the fifteen rounder’s number is JM92FHC. Buyers who reside in jurisdictions where those are permitted may sub unfired and unissued JM92FHC magazines for the same per-mag price. We have that information posted on this venue. Surface detractions are minimal to moderate, from carry in magazine pouches more than from insertion or ejection. It amounts to edge whitening and occasional finish freckling. We rate these magazines as Very Good, perhaps even Excellent condition, but photos ought to suffice for our distinguished shoppers to judge finish grade for themselves. Buyers will receive magazines from the same lot in the photos. All of these are excellent mechanically, and eminently serviceable. 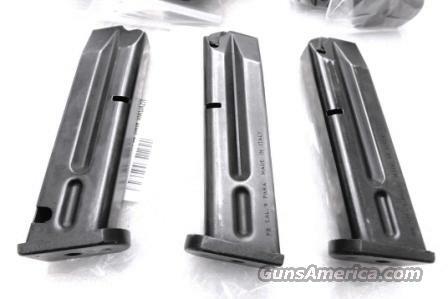 These magazines fit any 92 series Beretta Pistol with a double staggered magazine well, including models 92, 92S, 92SB 92F, 92FS, and M9. They will lock into place on 92SB Compact and 92FS Compact variants, but will protrude from the grip frame. They will not fit a model 96 because it is .40 caliber. They will not fit a Taurus 92 because the Taurus’s magazine release is different. They will not fit the valve handle of a 19th century Italian Bidet. They will only fit Beretta 92 series pistols chambered in 9mm Parabellum caliber, 9x19, 9mm Luger, call it what you will, THE 9mm. Own 1	for only	$ 23.00. Not for sale to residents of New York City. Any magazine deliveries into New York City require written permission of the Police Commissioner, so we cannot ship magazines into any of the six boroughs or 176 some odd zip codes, per NYC Code 10-131.10.